The Good Day New York Show on FOX5 TV New York! Post the concert at Symphony Space, Broadway, The Mohan Brothers were invited to talk about their music and perform for New York City’s prime newscast - The Good Day New York Show with Rosanna Scotto of FOX5 as the host. Mohan Brothers enthrall listeners at Berklee College, Boston! Premiere of USA Tour at The Egg Performing Arts Center, Albany NY! Strings in Harmony USA Tour 2018! The Mohan Brothers have been winning hearts of music lovers across the globe! They are back to the United States this fall! Catch the duo in concert! The Marvel of Jugalbandi concert series by Lakshay Mohan & Aayush Mohan concluded with the the Bangalore Premiere at Chowdiah Memorial Hall. Lakshay & Aayush presented some traditional compositions based on evening ragas along with Tabla and Pakhawaj accompaniment to the music loving audience of Bangalore who rewarded them with an overwhelming response and a standing ovation after the concert. Mohan Brothers at the Red FM studios! RJ Tuhin caught up with Lakshay Mohan & Aayush Mohan at the RedFM studios in Bangalore to have a conversation with them about the upcoming premiere of their Marvel of Jugalbandi concert series in the city the following day! Red FM is the Radio Partner for Marvel of Jugalbandi series. 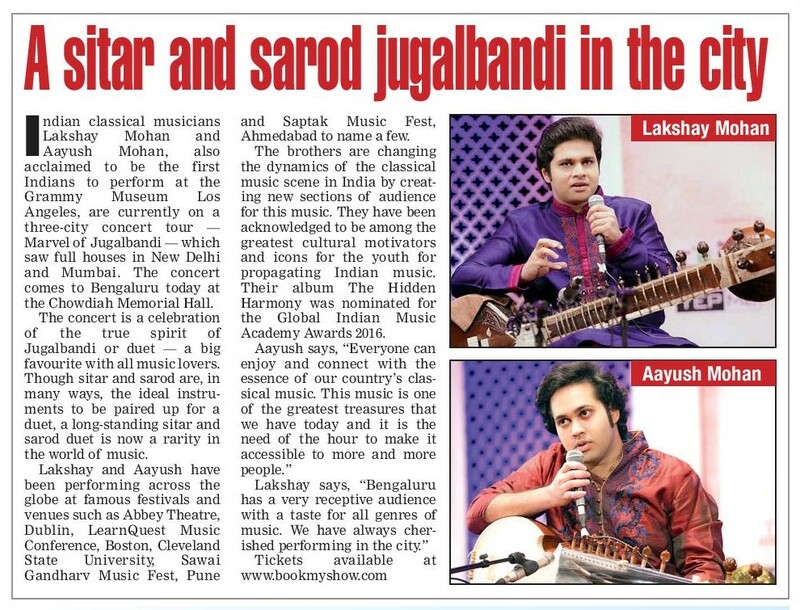 The Marvel of Jugalbandi concert series which saw Lakshay Mohan & Aayush Mohan perform to full houses in Delhi & Mumbai, is now coming to Bangalore. The finale concert of this tour will be held at the Chowdiah Memorial Hall on 2nd October at 7pm.